Holi event for you. 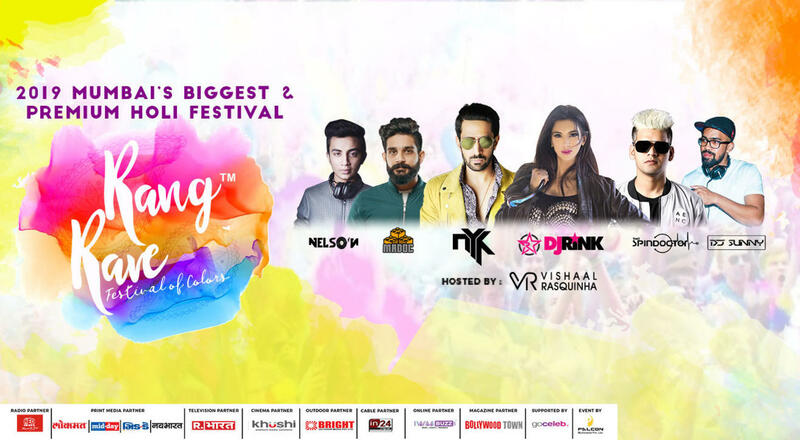 The Biggest and most premium Holi Festival in Country with RangRave at Mumbai. Brace yourselves for one of the most amazing Holi in Mumbai. This one is going to be the most ravishing so far!!! Nikhil Sahni better known as DJ NYK. #1 Award Winning DJ NYK and if EDM is your calling Then his mixes are topping the chart. There are great DJ’s and there are great producers. Never standing still, NYK is one of the rare breed that have always excelled as both. As happy on stage at the globe’s finest Clubs. Known as KING OF REMIXES ". NYK was awarded India’s #1 Bollywood DJ at the 2012 VH1 MyFav Awards. NYK continues to ride high at the pinnacle of the modern dance movement both as a DJ and, more importantly, a producer. To make someone dance on their tunes is an art and DJ is one such person who masters in this.Based in Mumbai and a Resident DJ at EXO and Libai at the St. Regis (Palladium Hotel), Mumbai since 2013, Anuraag Madoc is has performed for various events and weddings all over India and Internationally. Be it your sangeet/cocktail, wedding or any other occasion, he is a great option to keep everyone on their toes. DJ | Doctor | Turntablist | Video Dj | Played At Leading Clubs/Gigs/Music Fests All Over India . Sanjay Meriya, known as The Spindoctor, has established himself as a premier DJ spinning music that keeps people on the dance floor. He creates and performs electronic dance music, including remixes of club and hip hop favorites, house and amalgamations of other styles. A turntablist with various skills such as beat mixing, scratching, beat juggling, drumming, sampling etc., which allows him to teach the art of turntabilism at Audioqube, The True School of music and Party Map DJ Academy. DJ Sunny Started his career back in 2008, he's now one of Pune’s best DJ artist. Currently, he is a proud resident Of 5 Clubs & Lounges In Pune. And that's what made had resulted in his versatile expertise. He is passionate about his work and believes in true dedication. He has had the opportunity to share stage with many celebrities such as Yo Yo Honey singh, Yana Gupta, Sunil Grover, Gautam Gulati etc and had performed with many celebrity DJs like DJ Aqeel, DJ Suketu, Akbar Sami, Nucleya, Lost Stories, DJ Nyk, DJ Lloyd etc. NESCO Center, Gate No. 1, Ground 1, Western Express Highway, Goregaon (East), Mumbai- 400063.